After four years in the Sugar House area, the Bingham Gallery has recently moved to downtown Salt Lake City. The gallery has renovated spaces on the second floor of the Kearns Building. The gallery came to Utah when owners Paul and Susan Bingham decided to move here after operating art galleries in California for over twenty years. The Bingham Gallery features a number of well-known contemporary artists, including Gaell Lindstrom, Russel Case and Kathryn Stats. In addition, they deal in pre-1940s American artists of the California and Taos schools as well as early Utah art. 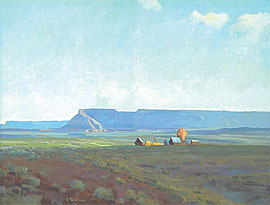 Of all the artists they have dealt in and represented, the Bingham’s greatest interest is Maynard Dixon, whose Mt. Carmel home they purchased in 1998. The Binghams are eager to preserve and promote the legacy of Dixon. The Gallery’s move to the Kearns building provides a unique opportunity for them to continue their efforts as it is located across the hall from the new offices of the Thunderbird Foundation for the Arts. The Foundation’s efforts are being spearheaded by Denise Begue, a native of Georgia and graduate of Westminster College. Begue has worked in the arts for a number of years, coming to the foundation from the Utah Symphony & Opera, after working for over three years as the senior development officer for the Utah Opera.